You can use OroCRM’s workflows to define rules and guidelines of possible actions and updates of the opportunities in the application. You can have multiple active workflows for the same entity at the same time (e.g. : alternative sales workflows that the sales representative can choose when they decide how to deal with an opportunity; parallel sales follow-up and order fulfillment workflows for a placed order, etc.). In the following example, we have two workflows for an opportunity which are active at the same time (Opportunity Management Flow and Opportunity Support Flow). To ensure data consistency and reasoned opportunity management by a sales manager, you can activate Opportunity Management Flow in System > Workflows. 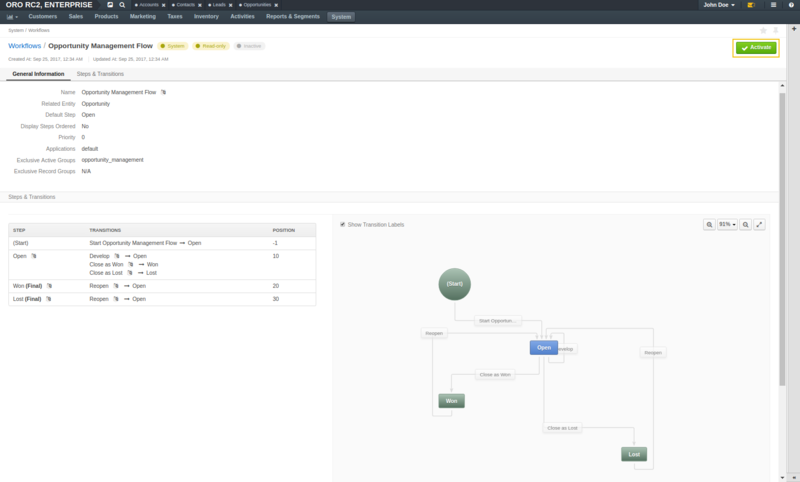 This can be done from the Workflows page by selecting Opportunity Management Flow and clicking Activate on the top right. Activating Opportunity Management Flow does not happen automatically for all opportunities. Once the flow has been activated in System > Workflows, you need to start it manually for the required opportunities. To close an opportunity as Won or Lost, use Close As Won/Close As Lost transition buttons instead. They are located at the top of Opportunitiespage. Note that it is not possible to close an opportunity from the table of all opportunities, although inline editing is available after flow activation. OroCommerce Opportunity Flow enables sales reps to create quotes directly from the opportunity page. All quotes created within a specific opportunity are displayed in the corresponding section of its page. The sales rep can manage quotes from this table in the same way they can manage them from the quotes table (e.g. edit or delete). Creating a quote from the opportunity page is only available if the opportunity is related to a Commerce customer. Otherwise, the workflow will behave exactly like the standard Opportunity Management flow (for standard flow, see the Manage Opportunity Workflow section of the guide). When OroCommerce Opportunity flow is activated in System > Workflows and an opportunity is related to a Commerce customer, the Create Quote button appears on the top right of the opportunity page. Creating a quote from the opportunity page is only available for open opportunities, i.e. not closed or lost. Note that availability of the Expire option for a quote within the opportunity page depends on the types of workflows activated in your system. Be aware that although opportunity relation can be displayed on the quote page, it is not possible to manage it. When there is no opportunity relation available for a quote, inactive Opportunity field is displayed. These exchange rates to the base currency will be used to calculate and convert the actual budget value, close revenue, the total number of orders (for OroCommerce), etc. You can export the opportunity details in the .csv format following the Exporting Bulk Items guide. You can import the bulk details of updated or processed opportunity information in the .csv format following the steps described in the Importing Opportunities guide.